SKU: N/A. Category: Baby Girl. 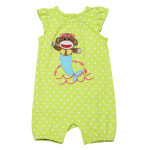 Light easy wear cotton fabric with monkey face embroidery. Fits 0-6 months. Newborn gift. Red, White and Brown colour. 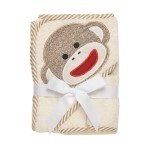 Washcloths and towels are something every baby needs! Pink soft and plush baby security plush toy with a hat. Security blanket attached for easy handling. Fun and unique. Monkey head of security blanket has a bonus in built rattle inside. Baby can shake rattle for soothing effect and discovering sound. Great toy for bedtime or long car trips. These security blankets provide a great source of comfort. Washable material. 30cm/12 inches height. The ability to form a deep attachment is one of the most important emotional qualities you want to help your baby/ toddler develop. While children are learning to attach to people they also like to attach to things. The attachment to people and things will help your child ease into independence. Printed Dot Flutter Sleeve Romper.